This is a one-year type coin that shows Liberty personified as a female figure facing left that has a Phrygian, or liberty, cap on a pole that extends behind her head. 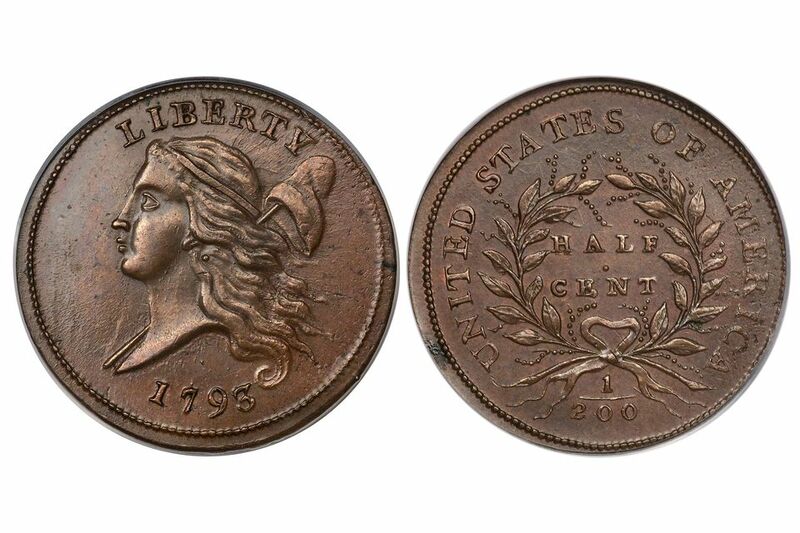 All coins produced were to have edge lettering that stated "Two Hundred for a Dollar." The design is very similar to a commemorative medal that was issued in France celebrating American independence. Approximately 35,000 coins were minted and given the demand for them at the time; most are in well -circulated condition. Uncirculated, or near uncirculated specimens sell for a premium price. Mint Mark Location No mint marks were used in this series. Obverse Description Liberty facing to the left, with a liberty cap on a pole behind her head. The word LIBERTY is above, and the date 1793 is below. A circle of beads is around the outer edge. The Half Cent - Liberty Cap - Head Facing Left (1793) was minted as indicated in the following table. The table lists the years, strike type, mint facility where made, the mint mark used on the coin and a description of any type differences in coins minted for that year. The following are popular errors and varieties that Half Cent - Liberty Cap - Head Facing Left (1793) collectors look for. These coins usually carry a premium and are valued above a common coin. The following table lists mint production numbers for the number of Half Cent - Liberty Cap - Head Facing Left (1793) produced at each mint facility. Where possible, production numbers by strike type are noted.